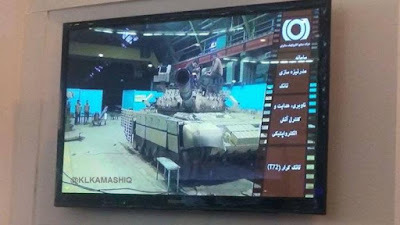 The new main battle tank (MBT) of the Iranian armed forces has finally been revealed to the public in March 2017. The original tank revealed as the so-called "Karrar" was an upgraded version of the T-72S Shilden, the last Soviet export version of the T-72 main battle tank. The Karrar is inspired by the latest Russian T-90MS tank, an enhanced version of the T-90. 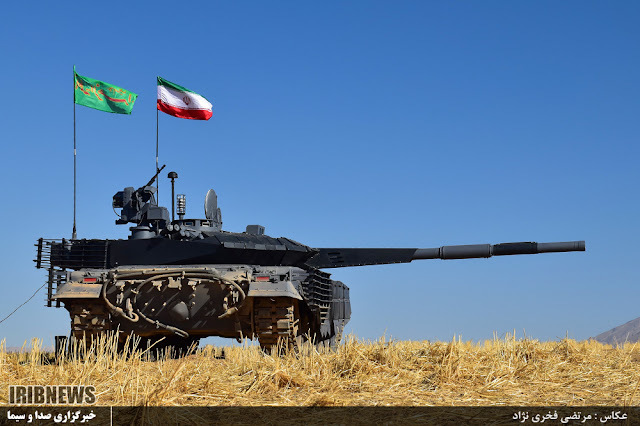 Unfortunately finding detailed information in English about Iranian tanks is rather problematic, so that the exact relationship between the T-90MS and the Karrar remains uncertain. According to Iranian news websites, the army tested the T-90S or T-90MS in or before 2015, but penultimately rejected buying the tank in favour for a local alternative. 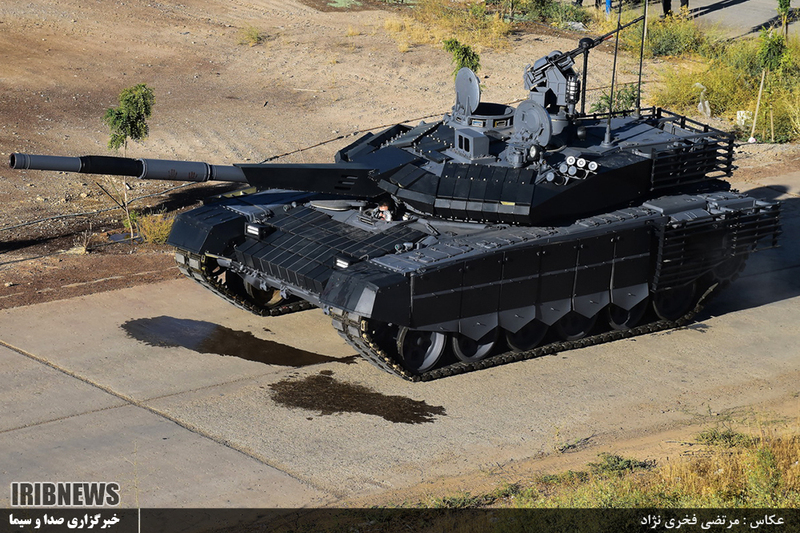 This lead to the development of the Karrar, but it is not entirely clear if it is meant to be a copy of the T-90MS or the similarities between the two tanks are result of the a cooperation with the Russian industry. Both versions have been mentioned in different forums and blogs. The Karrar tank is still an upgraded T-72S, but it is fitted with a completely new, welded turret as newly released video footages shows. It is also fitted with digital control panels and a battlefield management system. The base armor package of the Karrar's turret was improved, offering a higher level of protection compared to the older composite armor in the cast T-72S turret. Compared to the T-72S Shilden, the current MBT of the Iranian Army, the Karrar offers improvments to armor protection, firepower and electronics. There is no indication that the engine was altered, so the mobility appears to be equal to that of the original T-72S, maybe a bit worse as result of the weight increase. The tank features a new polygonal metal sleeve at the base of the gun barrel. The purpose of this design has not been revealed yet, but it might be an attempt to reduce oscillations when firing on the move. On some combat vehicles, such as the German Puma infantry fighting vehicle (IFV) and the Ukranian BTR-4, the gun barrel is enclosed in a metal casing in order to provide better stabilization when firing multiple rounds on the move. The armor protection has been improved by fitting a more modern ERA package to the tank. Previoulsy the T-72S was fitted with the Soviet-made Kontakt-1 armor. The new explosive reactive armor (ERA) covers the frontal aspects of turret and hull, while also protection the hull sides along the crew compartment. At the engine compartment and turret rear section, slat armor is utilized for protection against rocket-propelled grenades (RPGs). The turret sides are fitted with spaced composite armor modules. While the explosive reactive armor at the turret front and hull sides appears to be very similar to the Relikt ERA solution used on the T-90MS, the ERA package mounted at the glacis uses oddly-shaped ERA tiles, that are very thick, but have a rather small overall size. It is about twice as thick as the normal Kontakt-1 ERA used on the T-72S Shilden. 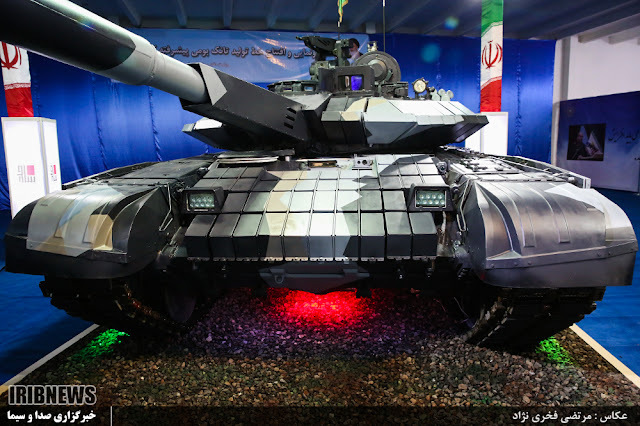 This type of armor is somewhat reminiscent to the ERA used on Iranian M60 tank. Most likely the reactive armor of the Karrar provides protection against RPGs, anti-tank guided missiles (ATGMs) with single-stage shaped charge warhead, as well as some degree of reduction in the penetration capabilities of APFSDS ammunition. It might also provide some limited protection against tandem shaped charge warheads, but that is not confirmed. 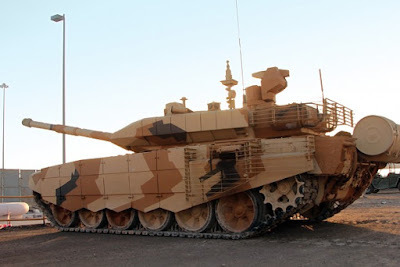 It must be noted that the latest version of the T-90MS also features explosive reactive armor covering the spaced side armor modules of the turret. 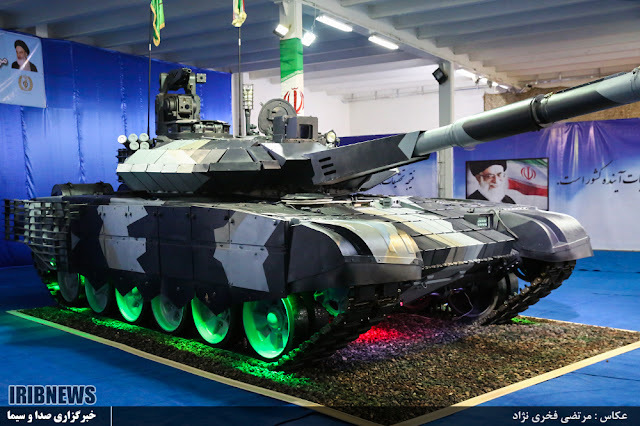 On the Karrar such armor is not found, suggesting that it might be reverse-engineered by the Iranian military industry based on older photographs of the tank instead of being a proper cooperation between Iran and Russia. Alternatively Russia might have only offered the older version of the tank, which lacked the enhanced side protection. Two banks of six smoke grenade launchers allow the tank to hide while retreating. 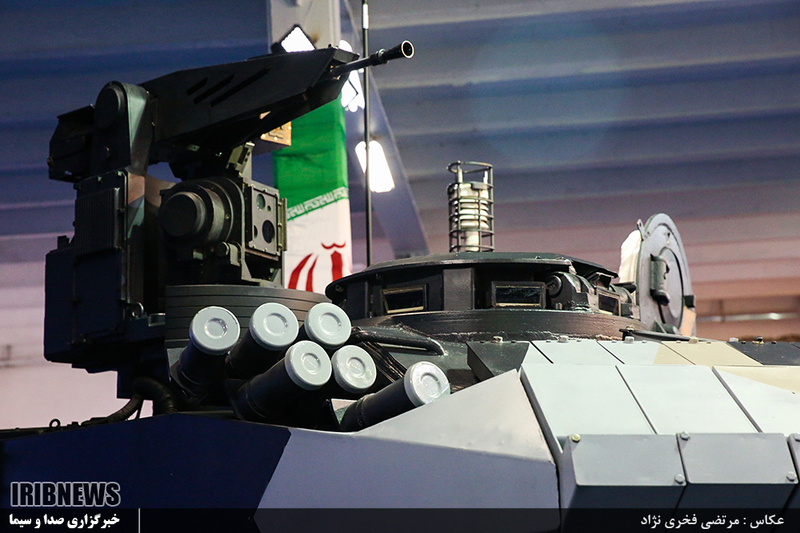 The Karrar is fitted with a remote weapon station (RWS), which is coupled to an independent optic for the commander. It includes a thermal imager, a day sight optic (probably a CCD camera with zoom functionality) and a laser rangefinder. The weapon station is armed with a 7.62 mm machine gun and also includes a secondary camera located left to the armament. This RWS desgin is also used on the T-90MS and on some products of the German company Rheinmetall, where it is known as main sensor slaved armament (MSSA), consisting of a heavy machine gun and a SEOSS sight. Older photographs show the Karrar being fitted with a different RWS, which usually is armed with a Soviet-designed PKT machine gun, but it seems to lack the same advanced optronics of the newer design. This remote weapon station is also a lot more bulky, because the ammunition container is located at the side of the gun. The fire control system (FCS) of the Karrar has been significantly enhanced. Aside of the new indepent sight for the tank's commander, the main optics for the gunner have been replaced. The gunner's sight now features not only a day sight, but also a thermal imager for enhanced target detection and acquistion at night and in situations with reduced visbility. The origin of the new FCS is unknown, but the local industry has utilized the EFCS-3 from the Solvenian company Fotona in the past to upgrade the dated M60A1 and T-54 tanks. The Defense Industries Organization (DIOMIL) of Iran also offered the KAT-72 FCS as upgrade for older generations of T-72 tanks. Both these systems however lack thermal imagers and independent sights for the tank commander, suggesting that the Karrar utilizes a newly developed system - probably incorporating imported technology. Iran has been supporting the Syrian government, which operates T-72 tanks fitted with the advanced Italian TURMS system. Iran also has good relations with North Korea, from which Syria imported components of thermal imagers for upgrading older T-55 tanks. A small searchlight, which probably can be rotated, is located next the gunner's hatch. The driver is provided with a new camera system next to his vision block, which contains two optics - probably a daysight CCD camera and a night vision optic. The tank also features new LED headlights. Suprisingly the Karrar appears to be one of the most advanced modernizations of the T-72 tank, albeit the performance and specifications of most components are currently unknown. If the engine was replaced - but there currently is no sources suggesting that this happned - the tank could be even better. It might be able it compare favourable to tanks such as the Russian T-72B3 and the Polish PT-91 Twardy in many aspects (such armor protection and firepower) - but in the end the crew performances matters just as much as the equipment. Well at least i or we know why Israel doesn't want EU, Russia, and other nation to lift sanctions againts Iran because they know what capable of Military Iran were rather than making missile. 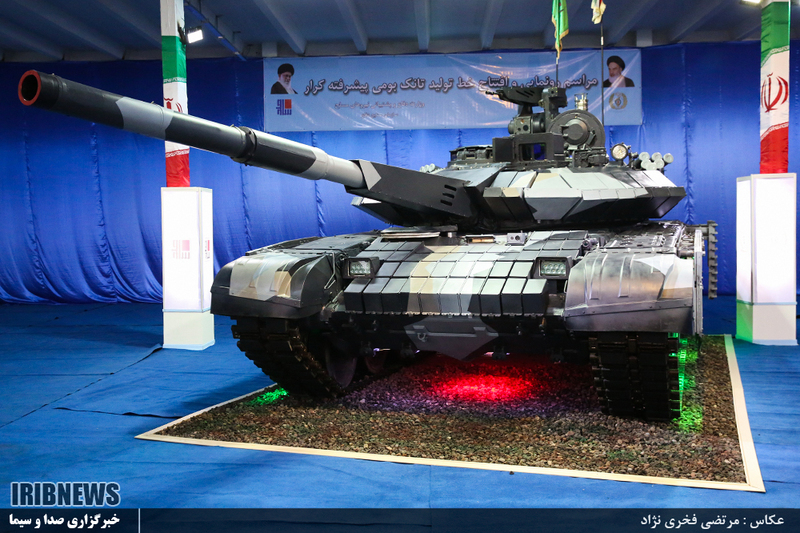 Anyway, even Iran Karrar has copy Russian T-90MS but at least it's not ugly as Tiam tank. However, Iran unveil Karrar tank it just only beginning because they say they gonna unveil their homegrown Active Protection System soon. I do forgot. The Karrar metal sleeve on the barrel also similar to Russian Armata tank concept if i'm not mistake. Is it a Russian or Iranian kit? It appears so close to T-90MS, one is inclined to think Russian. However crudeness of interior turret detail (including use of ordinary wingnut hardwareI) could mean Iranian copy. If and when kit is marketed to other countries, this may be better ascertained. 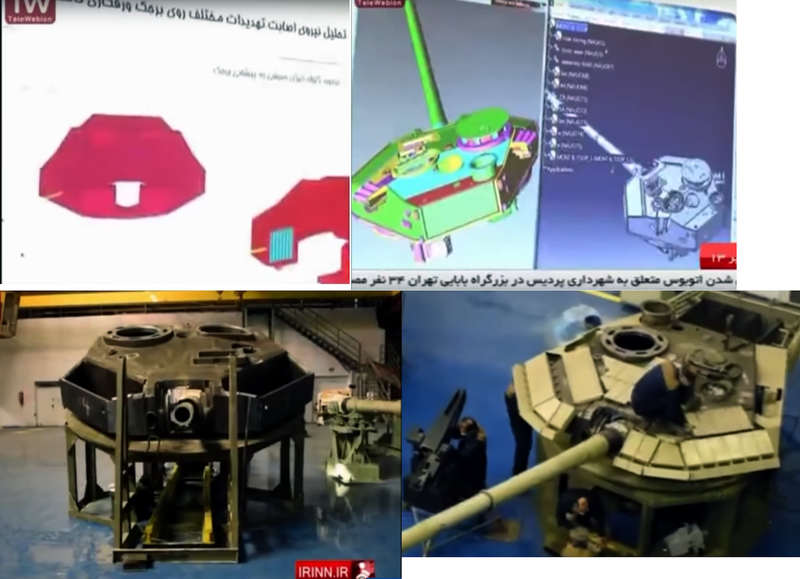 Iran media footage showed three different variations of armament for RWS. At the commander station, at least one of the portable display and computer units used is Panasonic, appears to be a CF-19. We haven't seen so far any evidence of the advanced military hardware made by Iran being used in the Syrian theater of war. Until we see it on the battle field we take all these as a part of psychological warfare. It's a long way from 3D modeling to the final product. It's far more tangible to do things than brag about them. I am a new, but enthusiastic reader of your blog. I noticed one thing, though. Maybe you could mark - or highlight - the changes you made to an entry when you update it. I've already read the latest entry, and now saw that you updated it. Now I would like to read the updated part, without having to read through all of it once more. Hello, I read this blog with great pleasure. I would like to know why Iran is not concentrating on the Zulfigar.After all, the Zulfigar is already in- limited - production. Furthermore, Iran has many different, obsolete types of tanks, which urgently need to be replaced.